Age of Wushu Producer Hopes Players Choose "The Wuxia Way"
Age of Wushu Producer Hao Han recently spoke with our sister site Warcry about everything from ethnicity-based conflicts to forced castration as the natural evolution of player choice. I don't know much about Age of Wushu, known in Europe as Age of Wulin, beyond the fact that it's a 3D martial arts action-MMO set in medieval China. Oh, and that you can forcibly castrate your fellow players. You might have heard something about that too - it's apparently quite a chore, but if you put your mind to it you can give someone the unfriendliest chop of all, just for fun. And exactly what kind of game would let players do that, you wonder? "We do have concerns on the concept, but also acknowledge this being part of history. Whether it's in reality or fictional tales, there are always characters that resort to everything possible when it comes to achieving their goals," Han told Warcry. "Having this concept implemented in game, we offer the power of choice and let the players decide their path." That's actually a fairly reasonable answer, and it jibes with comparisons of Age of Wushu to the niche hit EVE Online. But despite both of them being "free-roaming sandbox experiences," Han said the team at Snail Games doesn't compare its game to CCP's. 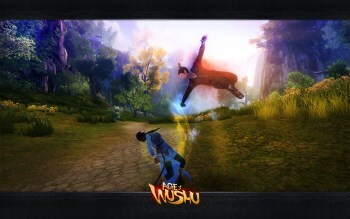 "Age of Wushu's philosophical pursuit is different from the sci-fi themed MMO," he said. "We incorporated traditional Chinese ideology of omnipotence and inclusion as well as the high level of detail we put into recreating the entire Ming Dynasty to ensure a maximized player experience. Our passion for Wuxia is what drives our development direction: We want players to feel they're experiencing part of history." The conversation covers a lot of ground and touches on topics including the game's attractiveness to female players, how players work outside of intended systems and what the developers hope to accomplish with the new expansion. If you're interested in Age of Wushu (or think you might be), it's definitely worth a look.